Milwaukee Brewers slugger Eric Thames scores on a Ryan Braun two-RBI double in the first inning. MILWAUKEE — Eric Thames put a brief scare into the Milwaukee Brewers. Baseball’s biggest surprise so far this season says he will be fine. 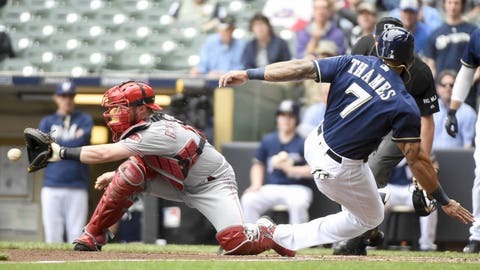 Thames scored twice before leaving with an injury, and the Brewers beat the Cincinnati Reds 9-4 on Wednesday for a three-game series sweep. Thames, who leads the majors with 11 homers, appeared to be favoring his left hamstring as he stretched before the Reds batted in the eighth. Manager Craig Counsell talked with him near first base before the two walked off the field. Jesus Aguilar replaced Thames. Thames, who returned to the majors this season after playing in South Korea for three years, felt the tug on his left hamstring five days ago, but played through the discomfort. He said he’ll back in the lineup Friday night against Atlanta. Orlando Arcia homered and drove in three runs for Milwaukee, which collected 14 hits. Jett Bandy had three hits and two RBIs. Ryan Braun snapped out of a 5-for-22 slump with a two-run double and a single off Rookie Davis (0-1), helping the Brewers improve to 6-1 against the Reds this year. Cincinnati hit four solo homers in its seventh loss in eight games. Scott Schebler went deep twice, and Joey Votto and Adam Duvall also connected. Milwaukee scored five times in the first, highlighted by Braun’s big double and Hernan Perez’s sacrifice fly. Wily Peralta (4-1) pitched five-plus innings for Milwaukee, allowing four runs and eight hits. He struck out seven and walked two. The Brewers outscored the Reds 53 to 26 so far this season. Davis was lifted after Arcia’s two-run homer and Jonathan Villar’s base hit in the third. Davis was charged with eight runs — seven earned — and 11 hits in 2 2/3 innings in the shortest of his three career starts. It was the right-hander’s first appearance since being hit on the right forearm by Pittsburgh’s Jameson Taillon on April 11. Reds: OF Phillip Ervin was optioned to Triple-A Louisville to make room for Davis. … The Red will activate C Devin Mesoraco for Friday’s game in St. Louis. Reds: RHP Tim Adelman (0-2, 2.70 ERA) makes his third appearance and second start of the season Friday night in the opener of a three-game road series against Lance Lynn (2-1, 2.70 ERA) and St. Louis. Brewers: RHP Chase Anderson (2-0, 1.13 ERA) makes his fifth start of the season Friday night in the opener of a weekend series against Atlanta. Bartolo Colon (1-2, 4.50 ERA) pitches for the Braves.